The world-famous research company Gartner published a report 'Hype Cycle for Emerging Technologies', according to which the excitement around the blockchain will soon come to naught, which, incidentally, does not mean the disappearance of interest in this technology. The technology of blockchain is on the threshold of a new phase of its adoption - "Through of Disillusionment", which means that "interest [in technology] wanes as experiments and implementations fail to deliver." 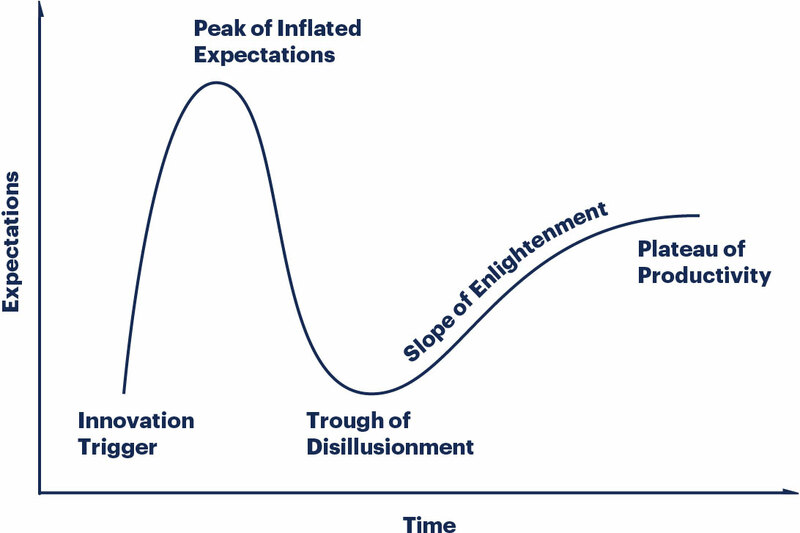 According to Gartner's technology development phases, the phase of "Through Disillusionment" assumes that "producers of the technology shake out or fail. Investments continue only if the surviving providers improve their products to the satisfaction of early adopters." Despite this, after this phase the technology can still move to the Plateau of productivity within 5 or 10 years. “Blockchain and IoT platforms have crossed the peak by now, and we believe that they will reach maturity in the next five to 10 years, with digital twins and knowledge graphs on their heels,” said Mike J. Walker, research vice president at Gartner. The other four technologies, which, like the blockchain, are in the HYIP cycle, according to Gartner, are democratized artificial intelligence, do-it-yourself biohacking, transparently immersive experiences and ubiquitous infrastructure. "Emerging technologies require revolutionizing the enabling foundations that provide the volume of data needed, advanced compute power and ubiquity-enabling ecosystems. The shift from compartmentalized technical infrastructure to ecosystem-enabling platforms is laying the foundations for entirely new business models that are forming the bridge between humans and technology."